The IRS has ruled some golf carts qualify for "Stimulus" tax credits. This makes some golf carts almost free. 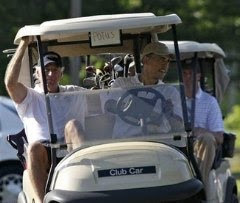 President Obama could object, but he is too busy playing golf. As part of the huge $878 trillion (Or was it $787 billion? Can anyone remember, anymore?) “economic stimulus” created in Washington last winter, Congress OK’d a tax credit of between $4,200 and $5,500 for Americans who purchase an electric vehicle. Some controversy arose as to which vehicles, exactly, qualified. The IRS recently ruled any electric vehicle qualifies for the subsidy, so long as it is road-worthy.